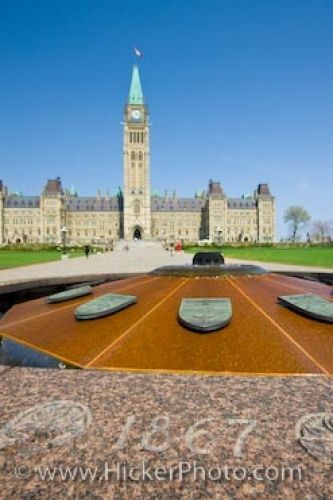 The Centennial Flame sits along the walkway of the Parliament Buildings on Parliament Hill in Ottawa. Located at Parliament Hill is the Centennial Flame which sits between Peace Tower and the Queen's Gates in the city of Ottawa. The Centennial Flame was constructed to celebrate the Canadian Centennial in 1967. Peace Tower which is a bell and clock tower, is located in the center of the Parliament Buildings. Peace Tower replaced Victoria Tower that had burned down in 1916. Centre Block and Peace Tower of the Parliament Buildings and the Centennial Flame, Parliament Hill, Ottawa, Ontario, Canada.